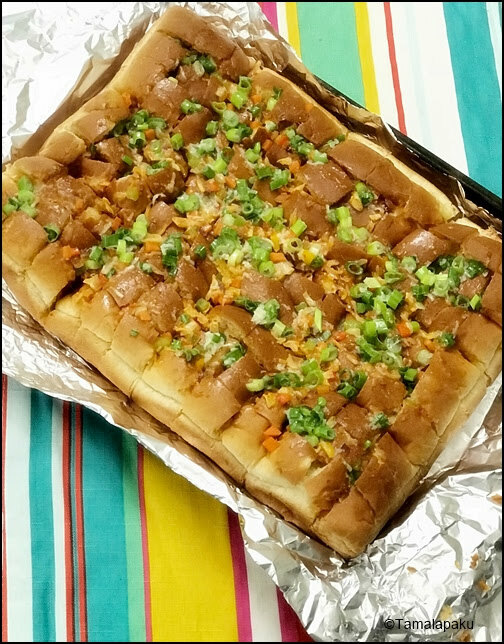 The stuffed cheesy schezwan pav is the ultimate fusion of the both the Indian and Chinese flavors. I can imagine these cheesy pav being served at a street food joint in Mumbai. Mouthwatering view, right? Trust me on this. The fusion of the flavors is mind blowing. The filling can be prepared in a few minutes and just account for the baking time and a steaming hot and tempting snack is ready. With this I have presented three Indo-Chinese Street food options (Schezwan Fried Rice, Chinese Bhel with Air Fried Noodles and Stuffed Cheesy Schezwan Pav) and my family has thoroughly enjoyed this theme and I have since made all the three at least 2 times each. Schezwan sauce has now become a permanent resident in my refrigerator. Note - I shall update the pictures as soon as possible. I had to take them at night and so the quality. In a heated pan, add a teaspoon of oil and saute the onions until they are translucent. Add in all the remaining vegetables and saute for a couple of minutes. They should not be cooked just a little to remove the moisture. remove onto a bowl and allow it to cool. In a mixing bowl, add the sauteed vegetables, shredded cheese, salt and schezwan sauce. Mix them well and adjust the flavors as needed. This is the filling we need to stuff into the pav buns. In a separate bowl, mix in the melted butter, grated garlic and finely chopped spring onion greens. Set aside. 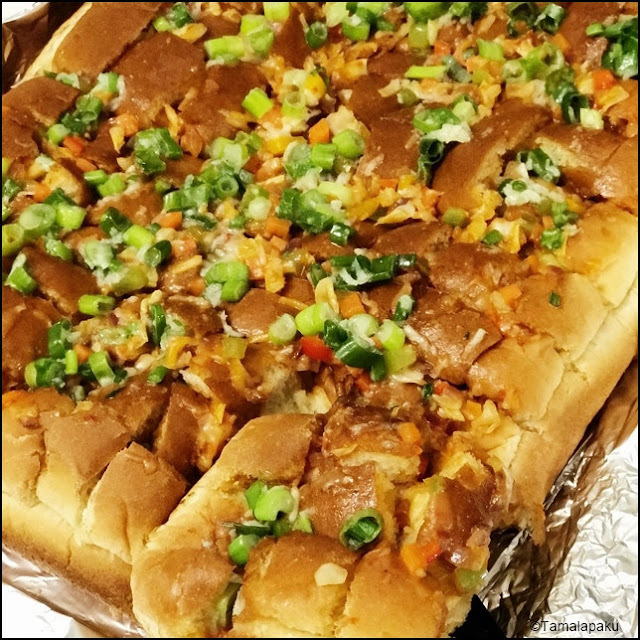 Place the pav buns on a long aluminum foil (so that it can be wrapped around the pav buns sealing the whole slab of pav buns). Using a sharp knife, make horizontal and vertical slits from the top on all the buns. Carefully put the stuffing into the slits making sure it is evenly stuffed in all the slits. Brush the butter mixture evenly all over the top surface of the buns. Cover the stuffed pav buns with the foil to seal well. Place the wrapped foil onto a baking tray and bake it in the middle rack for about 12-15 minutes. Remove from the oven and carefully unwrap the foil, slice and enjoy while still warm. I have been neglecting the 15 beans packet of beans in my pantry for over an year now. When my fellow blogger, Sandhya, posted a soup made with the 15 beans, it reminded me of the packet hiding in my pantry. I made a simple soup with basic flavors and found that definitely brings out the taste of beans in there. My kids don't need fancy ingredients to enjoy their soup. Just salt, pepper and a hint of garlic did the trick for this soup. My older one said that the Ragu pasta sauce lent a distinct flavor which she loved. I would typically add a couple of tomatoes but it just happened that I had run out of tomatoes and so substituted with Ragu Sauce. Wash and soak the 15 beans in 3-4 cups of water for about an hour. [This is optional]. Power the Instant Pot and switch on the 'Saute' mode. In the main pot add the oil and saute the grated garlic. After a few seconds, add onions and saute until golden brown. Then the carrots and celery go in. Add the Ragu pasta sauce and about 4-5 cups of water. Sprinkle salt and pepper. Mix well and add the washed beans. Close the Instant Pot lid. Cancel the 'Saute' mode. Press the 'Bean/Chili' mode and set it for 45 minutes. After 45 minutes is done, let it release the pressure naturally and the soup is ready to be served. [Adjust the consistency and flavors as needed]. The same soup can be prepared by pre soaking the beans and pressure cooking them. And the process is similar except that it needs monitoring by the stove top. This week I have chosen to highlight some kid friendly soups. Vegetable Corn Soup happens to be the most favored soup by my little one when we eat out. She loved the homemade version better than the restaurant version which made me happy :). This soup with simple ingredients and basic spices is a good one for a wintry evening. Boil 1/4 cup of corn and make a paste adding as much water as needed and set aside. In a heated deep pan, add butter and saute garlic. Add in the vegetables in the pan and saute for a few minutes. Add in about 4 cups of water and let the vegetables cook for a few minutes on a low heat. Add in the corn paste from step 1. Mix well and sprinkle salt as needed. In a small bowl, make a thin paste of cornstarch and water and make a slurry without any lumps. Mix in the slurry into the simmering soup. Let it boil for a few minutes. Sprinkle some crushed pepper and remove from heat. This is for Srivalli's Kid's Delight event, guest hosted by Srividhya themed on Soups and Stews. For today, I used a 640 watt Toastmaster brand sandwich maker as the appliance to make this eggless semolina pillow cake. If you have been following this series, you would understand that I am treating this series to be an experiment as I have never made a comparative analysis before. It was so much fun experimenting with these appliances and comparing the results. My family's Verdict - This pillow cake as my kids refer to was the clear winner. It was the best cake in texture, appearance, cuteness factor and ease of handling [Add portion size to the list from my side :)]. Next came the Microwave version and the last one was the air fryer version. To be frank, the air fryer version was not bad at all. I loved the air fryer version too as I enjoy the crumbly texture. The microwave version was the least messy, quick, easy to setup and easy to cleanup. In a mixing bowl, add Sooji, milk, yogurt, vegetable oil and vanilla essence. Mix well and set aside for 15 minutes. Add in baking soda, baking powder and the chopped almonds. Gently mix until well combined. Grease the sandwich maker, heat it for a minute and pour the batter into the triangle slots. Close and let the sandwich maker do the job. It is typically done when the sandwich maker shows the green light. But let it stay on for another minute after the green light appears. Power down the sandwich maker and gently run a knife along the edges and allow them to cool on a wire rack. For today, I used a 1000 watt GE microwave as the appliance to make this eggless semolina cake. If you have been following this series from yesterday, you would understand that I am treating this series to be an experiment as I have never made a comparative analysis before. I will give my family's verdict on Day 3. So stay tuned. I have made numerous types of mug cakes so I was fairly comfortable making this cake in the microwave. -The taste of the cake was good in all of the appliances. Only the shape and texture were slightly different. -The texture of the cake was good and properly cooked through. -As with any microwave cake, the taste was best while still warm. Pour the batter into a greased coffee mug or a ceramic ramekin. Microwave it for a minute. Remove and microwave it for another 20 seconds and leave it in the microwave for a few more seconds. Remove the ramekin from the microwave, run a knife along the edges and gently remove the cake from the ramekin. Enjoy the cake while it is still warm. This week I have taken up a unique theme of making one dish using three different appliances. I have decided to bake an eggless semolina cake using three appliances I own. For today, I used an Farberware brand Air fryer as the appliance. I am treating this series to be an experiment as I have never made a comparative analysis before. I will give my family's verdict on Day 3. So keep tuned. -The texture of the cake was crumbly. -The top of the cake browned faster and the cake wasn't cooked through at the end of 12 minutes. So my first batch had to be discarded. I then reduced the temperature to 325°F and baked for 12 minutes and let it stay there for another 10 minutes after powering it down. I used a disposable foil mini loaf pan (5 inch). I lined it with a parchment paper. Pour about a 3/4 cup of batter, place it in the air fryer. Set the temperature to 325 °F. Bake it for about 12 minutes. Remove and check for doneness by inserting a tester. Power down the air fryer and let the cake remain in the basket for another 10 minutes. After the cake is just warm, run a knife along the edges and gently remove the cake from the foil pan. Allow it to cool down completely before slicing. Check out the Blogging Marathon page for the other Blogging Marathoners doing this BM#83.